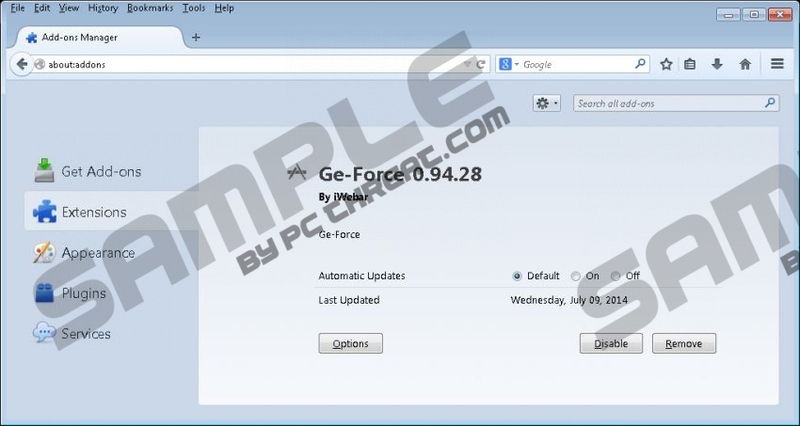 Ge-Force is a Crossrider browser add-on which you should remove from the computer once it starts displaying its pop-up and in-line advertisements. This browsers add-on is compatible with Internet Explorer, Google Chrome, and Mozilla Firefox. The program is bundled with various free programs, including FLV Player, and distributed by phishing websites. Malicious websites are very often promoted by pop-up advertisements; hence, you should avoid clicking suspect advertisements and links in order not to get redirected to dangerous websites, which may put your personal data at risk. One of such websites is applicationgrabb.net, which is normally blocked by reliable security tools upon accessing it. Ge-Force, published by iWebar, inserts in-line advertisement into basically every website you access. In-line ads, also known as in-text advertisements, are advertisements that pop-up when you mouse over the word underlined by an adware program. Advertisements of this type may be unrelated to the underlined words, which are selected randomly. Ge-Force ads promote multiple products and services, and they contain the label ‘Ads by Ge-Force’. It is important to note that Ge-Force is not responsible for the offers and recommendations delivered to you because the display of the pop-ups does not prove the companies’ endorsement of third-parties. You interact with advertisements at your own risk, which is why it is advisable to remove Ge-Force from the computer. If you have recently installed some other program and cannot browse the Internet as usual because the browsers are flooded with annoying pop-up windows, it implies that you have no reputable security tool and that you do not read the information provided by the installation wizard. You may skip check boxes concerning the settings of the browsers or some other important information. It is crucial to pay close attention to every installation process because you may not like the consequences. The adware program may be monitoring you in order to gather information about your browsing habits. Programs such as Ge-Force are mainly aimed at recording search terms, clicks, impressions, browser settings, time spent on various websites, and other non-personally identifiable information. In some cases, personally identifiable information may be recorded, too. If you want to prevent such programs and the consequences that may follow, you should pay more attention to your online security. What you should do now is remove Ge-Force and shield the operating system from Internet-based malicious programs. Below you will find our instructions on how to uninstall Ge-Force or any other undesirable program that has its uninstaller in Control Panel. But we recommend that you use a powerful anti-malware program because the computer may contain some browser cookies and other unreliable files. The system has to be protected against Trojan horses, rogue anti-virus programs, browser hijackers, ransomware, and many other threats; otherwise, you put your personal data at risk. Select Uninstall a program and remove Ge-Force. Ge-Force is bundled with other programs, and, if you do not remember installing it, it is very likely that it arrived at your computer along with some other program. You can easily find out what further actions have to be taken by scanning the system. Click the button below to download our recommended scanner, which will readily examine the system. Quick & tested solution for Ge-Force removal. what adware is asccoiated with ge-forces? when i looked into my control panel, there are no ge-forces or related software installed. still, it always appear in my browser. i already reset my browser, remove unfamiliar extensions but still, its there. what could be the other reasons for its existence as well as other options on removing it. thanks! helps from this site and other concerned persons are well appreciated. Ge-Force usually comes bundled with "Sense", "SaveP***** 1.1", and "Shopper-Pro". You probably want to remove those too. ge-force and sense will not uninstall in my control panel. any suggestions? Ge Force is a real pain, I didn't down-load it and have tried several different ways of un-installing it with out success.It is absolutely infuriating when you think that this is my PC and these bo-zoes have invaded it.Something needs to be done. I cannot get Ge-Force to uninstall on my in-laws desktop, regardless of what I try. This is crazy!